Today not only for people of Nagpur but for entire Central India, Orange City Hospital isn’t just another multi specialty hospital but a cradle of hope that cherishes & nourishes human life more than anything else. In the matter of mere 17 years of its existence Orange City Hospital Nagpur has touched and saved millions of lives with the help of its proficient team of doctors & nurses and par excellent technology. And moreover, these human lives have been touched & saved at very cost efficient prices. This prominent Nagpur based multi specialty hospital offers 60 specialized departments, over 160 well qualified and most proficient doctors, a team of 200 plus devoted nurses and most cutting edge technology all under one roof. As mentioned earlier there are 60 departments at Orange City Hospital that cater to almost all the general and modern day medical specialties. Given below is name of some of the very important departments. At the helm of these departments, needless to say, are the most proficient & well qualified doctors of India. Along with superior technology, Orange City Hospital’s management has also ensured that general facilities work at optimum level round the year, which invariably has brought good reputation to the hospital. Given below is complete list of all the general facilities available at Orange City Hospital Nagpur. Separate accommodation for visiting relatives. In mere 17 years of its existence, Orange City Hospital has achieved many milestones, which are testimony of its great service in the healthcare field. These achievements & milestones have also helped the hospital in earning enormous trust amongst general public of Central India region. Listed below are some of the milestones that Orange City Hospital has achieved during its illustrious years. 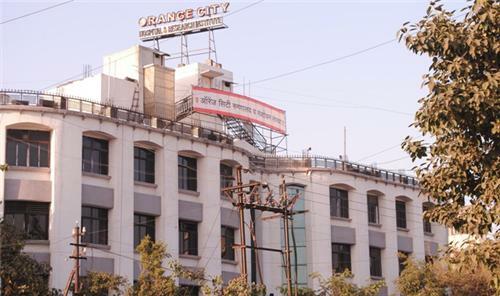 Orange City Hospital is the only ISO 9001:2000 certified hospital in entire Nagpur region. The only hospital in entire Nagpur that brings highest number of well qualified doctors under one roof. It is the only hospital in entire Nagpur whose Emergency room is fully capable of providing emergency services to VVIP’s encompassing their Z plus security guards. It is the only hospital in entire Central India region to have been recognized by Central Railway for rendering best emergency services during railway train accidents. It is the only hospital in entire Central India region that provides Air ambulance services during emergencies.